That sense of familiarity when stepping into the huge space at Toa Payoh where Swatow Seafood Restaurant is is one that we can always resonate with. The Teochew restaurant brings to mind the good times we have with our families, and the aroma from the food is something we’ve known since we were kids. As more traditional restaurants such as Swatow get lost with the younger generation, the stronger the need is to preserve the traditions and the culinary skills of Teochew cuisine and all the trained chefs. Most Teochew dishes take a lot of preparation time, and a restaurant like Swatow is hard to come by – where the food is not only the perfect comfort remedy, but nothing short of authentic and tasty. As the Chinese New Year is drawing near, we are reminded again of our roots and a visit to this Teochew restaurant did just the trick for us. Here is everything to love about Swatow Seafood Restaurant – Authentic Teochew Fare For The Family At Reasonable Prices. 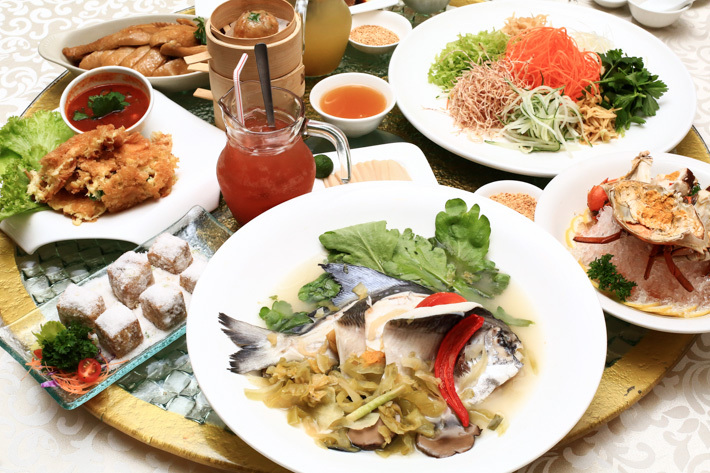 Teochew cuisine emphasizes a lot on the freshness of the ingredients, and the culinary is circled around bringing out the essence and true flavours of every ingredient. Teochew dishes are hence light in taste and more often than not “naked”. Very often associated with healthy food, the method of preparation revolves largely around steaming, poaching and braising. Stir-frying is not uncommon, but oil is used sparingly. Sauces and condiments are aplenty when it comes to dining the Teochew way. Mostly made from scratch, there is a myriad of options when you need something to complement your dishes; think chilli and soya, garlic sauce and fermented bean sauce. 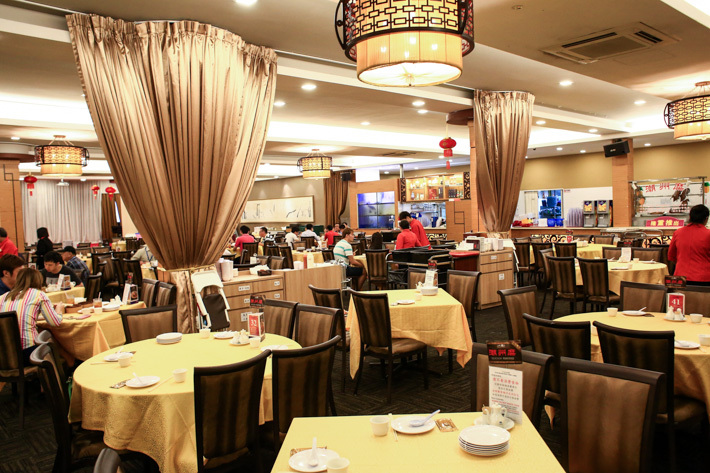 Swatow Seafood Restaurant has two separate menus for you to choose from – the Seafood menu and the Teochew Porridge menu. You can order dishes from both menus simultaneously. Start your meal with these Crystal Dumpling Teochew Style (S$9 for 6). Steamed and best eaten piping hot, these dumplings wrapped in translucent skin are part of the dim sum menu and make a great appetizer! Cold crab is a classic Teochew dish and the Teochew Cold Crab (Seasonal Price) at Swatow is a must-order. What lies beneath its stark simplicity is the sheer freshness. Teochew cold crabs’ emphasis is on the roe, and if there is no substantial amount of the creamy delight, Swatow will not serve it. The best and only the best will be put on your table; this is dedication to the true Teochew cuisine. So this dish will definitely be worth your while. Steamed first then served chilled, enjoy the true experience; eat it plain like that and enjoy the beautiful creaminess – without any sauce and condiments. Because the Teochews take their braise seriously, a meal at Swatow is not complete without one or two braised dishes. The Teochew Braised Duck Meat (S$15 per serving) hit us hard with nostalgia. The tender meat soaked in the sauce is something we can enjoy every day, and is served with beancurd on the side. If you prefer more exotic cuts of the duck, Swatow Teochew Restaurant also offers serving of Braised Duck Webs and Wings (S$12 per portion). Now, this is one dish that you must try! The Swatow Kampong Chicken (S$12 per serving or S$18 for half chicken) won us over with the first bite; everyone on the table had seconds. Well-cooked chicken that is prepared with a fermented bean sauce, producing a savoury flesh that is so smooth and succulent. It comes with a side of ginger sauce, though we think the chicken should be best enjoyed in its naked glory. This dish of Steamed Pomfret (Seasonal Price) should be comfort food for all, yes? Prepared in the same style that our parents whip up in the kitchens at home, this classic fish dish is one of the best representation of Teochew cuisine. Only the freshest catch can be used, else this dish would reek of stinky fishiness. At Swatow, the silver pomfret is huge with shiny white flesh. Steamed with preserved vegetables, ginger and plum, this healthy fish dish is one that will please every diner on the table. This came out as one of the top contenders for the best dish of the day. The Crispy Oyster Omelette (S$15 per serving) looked every bit unphotogenic, but you want to know what makes it one of Swatow’s best-selling dishes? It is the fact that more eggs are used instead of flour – like what it normally is everywhere else – and that they deep-fried it to a brilliant crisp, leaving us all in awe. The accompanying sambal sauce served on the side is filled with juicy and plump oysters. What more can we ask for? The Teochew Braised Eight Treasure Vegetables (S$16 per serving) is a huge, substantial portion. This should be the star vegetable dish at Swatow. Mustard greens are used despite the higher food cost because its sweetness will elevate the taste of the entire dish. Together with several types of mushrooms and moss vegetable, this is one value-for-money dish! On to more Teochew goodies, and this platter of four sides feature quintessential Teochew-style bites. The four stars are Chilled Jellied Pork Knuckles (S$8), Teochew Chilled Sliced Braised Pig’s Head (S$8), Crispy Pork Roll (S$8) and Crispy Pork Liver Roll (S$10). They are all served chilled, ala the traditional Teochew way. The Sugar-Coated Yam Cubes (originally made into bars) (S$16 per serving) is the only dessert at Swatow you need to try. For one, few Teochew restaurants in Singapore offer this dessert as it requires notable skills and a significant amount of preparation time. It looks simple, but read this. The chef has to first deep-fry the yam cubes and set them aside. He then melts the sugar in the wok, and tosses the yam cubes back in before turning on a huge fire. Immediately after, he tosses again rapidly, this time to transform the melted sugar back into a powdery form that will cover the yam cubes completely. The end result is one sweet treat so amazing that loyal patrons return for regularly. Do note that the yam cubes will not be available during the Chinese New Year period. Available during the Chinese New Year period is this classic Teochew-style yusheng that differs slightly from the conventional ones. No pickled and preserved elements; just vegetables that are freshly grated, and dressed with a homemade plum sauce that was not cloyingly sweet. It was almost like an ideal palate opener for us as each bite was very refreshing and crunchy. Swatow Seafood Restaurant is having a Chinese New Year lucky draw. From 25 Jan to 22 Feb 2016, spend a minimum of S$250 in a single receipt to stand a chance to win a pair of return airtickets to Hong Kong. You can find out more details of the lucky draw on Swatow’s Facebook and Instagram. This post is brought to you by Swatow Seafood Restaurant.